Sarah's Tuck-In is a brilliant place, pointed out to me by I Like. Inside the equally brilliant Grainger Market. 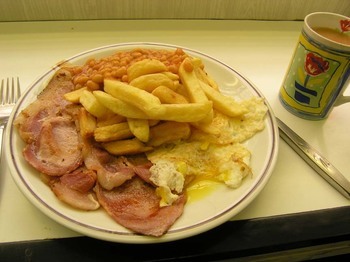 A top North East fry-up. A huge quantity of bacon, nice fat chips, the works. This’ll fill you up. It's beautiful. Like a modernist sculpture. And you could sit there all day and watch the world go by. This place is fantastic. I used to go here for fry-ups with my brother in the early 90's, after shopping in the Greenmarket for cheap computer games. Long may the Grainger Market live! I've just read some of your book and you refer to the las time one heard an East Midlands Accent. I like to think that Busy Lizzi or whatever her name is off Smarteenies has an accent from somewhere like that. Am I wrong? Not sure about Busy Lizzi to be honest. I'm not familiar with her. I'll have to ask around. I like Sarah's as well. the Grainger Market was one of the first things I saw when I came to Newcastle in 1990 - I'm still here. But don't you think the condiments have a somewhat bleak, scared look, as if all their companions have been gradually swiped, leaving them to wonder who's next? The recently-departed Bergman would understand.